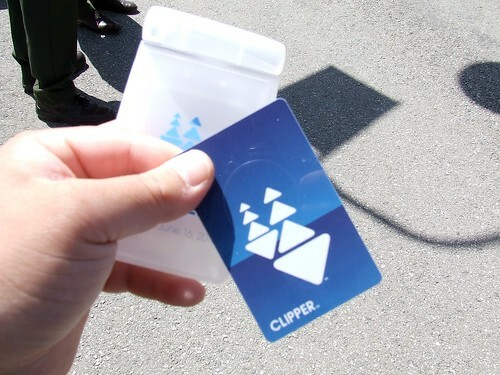 I've been reporting for the past few weeks about Muni's plan to end the issuing of paper transfers for free Muni rides at Daly City BART in favor of going electronic only on the Clipper card starting June 1st. For many regular residents, the change would not affect them as they would still be able to ride Muni away and back to that particular BART station. For SF State students, staff and faculty, the end of paper transfers would result in a much more challenging problem. As I've mentioned before, with the current policy regarding the use of the Clipper card, SF State affiliates have two options, they can take the free ride on the Muni 28 line or take the SF State shuttle. Either way, the ride away from the station is free. However, the return ride is much more challenging as those who took the free shuttle earlier has their free ride back on Muni voided because of a current rule: If a passenger does not tag their Clipper card on a Muni bus within one hour of exiting the Daly City station, the return ride transfer is VOID. When it comes to SF State students and rising university tuition and fees, justifying to pay an extra $2 to ride back to BART can get expensive and not many are happy about the changes. What really stirred the pot of controversy was what the university's CampusMemo (a weekly employee newsletter) and the student operated Golden Gate Xpress newspaper reported to the public. Both the CampusMemo and Xpress reported that the return ride on Muni to Daly City BART would be free, even if the person took the campus shuttle to the campus. But they did not highlight their source of information about this new change in policy, and I solely relied on the SFMTA's alerts page about the upcoming change on June 1st. When You Need Help, Just Ask! Instead leaving the big elephant in the room with a huge sack of peanuts to see what will happen, I decided to contact the SFMTA for some assistance. I e-mailed Paul Rose, Media Relations Manager of the SFMTA and asked him if the university was correct in the new policy change to allow SF State affiliates to ride back to BART for free within 24 hours of exiting the station, even if the person took the campus shuttle away from the station. SF State brought this issue to the SFMTA’s attention and have come up with a solution that will be implemented no later than August 1. Although the initial transition will take place effective June 1 and customers will be required to take the first transfer to Muni within 1 hour from BART, this will not impact SF State students as the shuttle does not run during the summer. A business rule change will be in place by August 1 which will extend the transfer period requirement for the first trip on Muni to 23 hours which will continue to allow SF State students to take either the shuttle or Muni for their first trip and allow a second return trip within 24 hours. We will update our website once the change is closer to taking place. Based on what Mr. Rose stated, this means SF State affiliates can take their first Muni bus within 23 hours of exiting Daly City, and can still take a second free ride on Muni within 24 hours. This definitely benefits the campus community and provides additional flexibility for those who takes the campus shuttle. It also clarifies the confusion of if they will have to pay for the ride back to BART or not. An Exploit for Non-SF State Affiliates? While it does benefit the students, the unintentional consequence (or benefit) is that non-SF State affiliates can also use this to their advantage. If the passenger exits Daly City BART and a family member picks them up from the station, the passenger still has two free rides on Muni and must use the first free ride within 23 hours and is eligible for the second ride within 24 hours of exiting the station. Why? Muni buses and trains does not register on their Clipper card operator consoles on what route and direction they operate. In fact, if you log into your Clipper card account online and download your activity report, you will see that if you tag your Clipper card on a Muni vehicle reader, it will say: "SFM Bus" indicating you took the Muni, and "MTANONE" as the route. If Muni maintains that policy of not indicating what route the bus runs on their Clipper consoles, for the bus lines that covers Daly City BART (14L, 28, 28L, and 54), this means passengers scores two free rides on practically any bus line on Muni. Say for example: I exit Daly City BART with my Clipper card and my wife (in reality, I'm still single) picks me up at the station. The next morning, I can ride any two Muni lines I want and not pay a single cent because the operator console uses a generic universal identification for the entire Muni fleet. I guess you win some and lose some. On a final note, this is the first time I've ever contacted a media relations manager for anything relating to my blog, and I appreciate Paul Rose taking time out of his day to conduct some research and provide me a helpful response to share with my readers. Cheers to you.